Australia-based Redflex Traffic Systems is to supply New Zealand Police with the latest radar-based fixed speed enforcement systems under a national rollout of cameras at sites with the highest risk of speed-related crashes. The contract is for 56 REDFLEXspeed fixed speed enforcement systems, with twelve systems to be deployed in 2014. All remaining systems will be installed by the end of 2015. The first new camera will be installed for testing at Ngauranga Gorge in Wellington and will eventually replace the camera, which has been in use at the site since September 2013. The new camera will undergo a rigorous testing and calibration process before going live in July. Police will use mobile cameras and other enforcement while the camera is being tested. The first digital enforcement system to use non-intrusive dual radar technology, REDFLEXspeed is housed in a discreet, secure and slim-line enclosure for roadside mounting, launched at Intertraffic 2014. The system utilises an 11MP digital camera to provide high-resolution colour images for reliable offence verification across up to six lanes of approaching and receding traffic. Dual-radar technology adopted in REDFLEXspeed makes this the first speed enforcement system in the world to have two radars independently verify every speed measurement. It delivers extremely accurate speed enforcement in all weather conditions, with lane identification, vehicle position and positive vehicle classification. The contract also includes REDFLEXdcms real-time remote camera monitoring for real-time remote monitoring of the enforcement camera network and notification of any problems detected. REDFLEXdcms automates camera operations and provides secure incident downloads from Redflex cameras, with built-in reporting and analytical capabilities and report customisation. Assistant commissioner Dave Cliff says: "Announcing the first sites that will receive the new advanced cameras represents an exciting step forward, as we work with our road safety partners to save lives and prevent serious injuries on our roads, particularly in those places, where the evidence tells us there is a high risk of speed-related crashes." New Zealand Transport Agency road safety director Ernst Zollner says the rollout of the new speed cameras will be welcomed by most New Zealanders: "Effective speed management is an essential part of creating a safer transport system, because the speed a vehicle is travelling at directly affects both crash probability and crash severity." 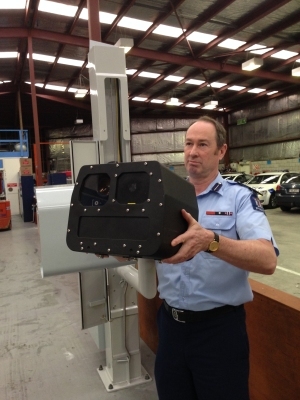 Redflex CEO Ricardo Fiusco says: "Redflex already has a good working relationship with New Zealand Police, being the supplier for their mobile speed camera programme. We are delighted to supply fixed speed enforcement systems to further aid their road safety initiatives". For more information, please contact Redflex. Photo: courtesy of New Zealand Police.